The government heralded the fall in unemployment as evidence their economic strategy is working - but in deprived areas the picture is less rosy. The government recently heralded the fall in unemployment figures as evidence that their financial strategy is working and the economy is slowly beginning to heal. This may be the case in David Cameron’s leafy South Oxfordshire constituency, but in deprived (and mainly Labour) areas such as Brent the picture isless rosy. The latest labour market statistics show that the UK unemployment rate went down by 0.1 per cent from September to November compared to the previous three months. 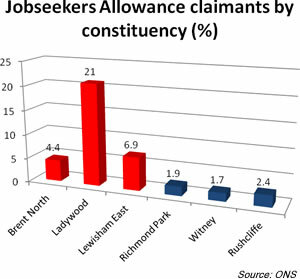 The data also shows unemployment falling by 37,000 for the same period and the number of people claiming Jobseeker’s Allowance (JSA) dropping by 12,100. But things aren’t quite so prosperous in Brent. The complete opposite is happening, with unemployment rising coupled with a regular increase in the number of people claiming JSA. From September to November there were 30,000 people out of work, which is an increase of 1% compared to the three months from June to August. Given the significant challenges facing Labour boroughs, today I hosted a discussion shadow chief secretary to the Treasury Rachel Reeves MPand local businesses in Park Royal about how to kick-start the economy. This will platform Labour’s plan for jobs and growth, including a temporary VAT cut, a national insurance holiday for small firms taking on extra workers and investment in infrastructure and affordable housing. It will also showcase the long-term reforms needed to make the economy stronger, such as proper reforms to our banks to boost lending to small and medium sized businesses. The recent GDP figures also showed the economy shrinking by 0.3% in the last quarter. There are already warning signs appearing on the horizon that the UK faces a real risk of slipping into a triple-dip recession. The disruption to transport, employee absence and the impact on the retail sector caused by the recent bad weather could also lead to another fall in GDP in the first quarter of 2013. Increasing domestic demand and encouraging household spending will continue to be an ongoing challenge for the government. The case has been made by a chorus of economic commentators, including the IMF’s chief economist Oliver Blanchard who recently called on the chancellor to ‘take stock’ of his austerity policies to prevent further economic stagnation. Even Nick Clegg conceded that the Lib Dems have scored an economic own goal by cutting back on capital spending. With the economy flatling and borrowing going up the government needs a major rethink of its budget policies. Cutting government spending does not lead to growth and the drastic austerity measures are harming the chances of economic recovery. With the UK deficit continuing to grow, the prime minister’s proclamation that the ‘good news keeps coming’ sounds embarrassingly out of touch. There is a real risk that our economy could go down the same route as Japan and incur a lost decade – a period plagued with low growth and increasing public debt. We may not have a lost decade yet, but we certainly do have a lost government. Indeed. A lost decade is now a GOOD result.